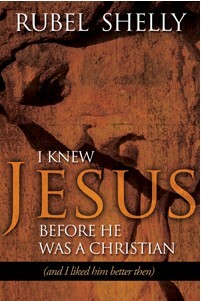 The full title of Rubel Shelly’s book published by Leafwood Publishers (ACU Press) is “I Knew Jesus Before He Was A Christian…and I Liked Him Better Then.” When I was asked to review the book, I was intrigued by the title. As I began to read, it became apparent that the title was not merely cute to boost sales, but was entirely appropriate for the material. Our small group was deciding what book to study next and I suggested this one. Rather than read through it before the group studied it, I waited to review the book in order to include it’s effectiveness for a small group study. The conclusion is that I Knew Jesus… works well for small groups. Precisely because it compares the original churches to churches now and the Jesus of the Bible to the Jesus nonbelievers perceive to be preached in churches today. The subject is – and should be – on the minds of all church and small group members. That is what many Christians have heard, unfortunately, far too often. Then there is the oft-quoted “I’m spiritual, but not religious.” In chapter four, Shelly tells the story of author Anne Rice. Rice renounced the Catholic religion at age eighteen. After a series of tragedies, including the near loss of her life, she renewed her commitment to the Catholic faith. Rice wrote a book about the experience, dedicated herself to “glorifying God,” and launched a series of Christ the Lord books. Which is precisely the point Shelly is making. The Jesus of the Bible – and by extension, of the original churches – is not the Jesus the people of the world see proclaimed by many of today’s churches. We should strive to be more like the Jesus of the Bible than the Jesus we portray through the filter of our organizational structure and polity. Rubel Shelly, in I Knew Jesus…, looks at different aspects of the disconnect and barriers between Jesus and the church. The author challenges and encourages the reader to work toward solutions in their own lives and churches, with questions found in the discussion guide. In I Knew Jesus Before He was a Christian, Shelly uses real-life and biblical examples to illustrate that while church membership may be declining, there are still souls searching for the life-affirming love of Christ. For a church to be a model of the first Christian churches and the life Christ displayed, they must first exhibit Jesus in the community and participate in ministering to those in need.